Place your 1 ½” Steel flange in the center of the 2’ x 2’ MDF Board. Mark off the locations of the four holes so we can secure the flange to the board. Take your PVC pipe and cut it to whatever height works for your prop. Remember that the top of the pipe will be at shoulder height. Sand down one end of the pipe with sandpaper or I highly recommend using a dremel. The main goal here is to make the pipe fit snugly into the 4” steel pipe on the base. Next, stick the 4-way or 3-way PVC cross on the top of your PVC pipe. Now we need to cut the pipe for the arms/hands. I used this web page to figure out proportionate lengths of shoulders and arms for the overall height of my prop. Once you got all your pieces cut and put together. Drill some drywall screws through each PVC fitting and pipe to hold them secure so they don’t come apart or twist. On the end of the hand on my prop I attached a PVC cap and screwed in a metal hook. This is where my lantern is going to hang from. Depending on the position of your reaper you may need to add some supports to support the weight of the burlap when it has the monster mud on it. I used a couple brackets I listed above that I found at home depot and some scraps of wood. The brackets are nice because they are thin enough to bend to the shape you need and can be easily attached using drywall screws. Also, now would be a good time to run any wiring if you are going to hard wire a lantern or electrical prop. Now for the fun part! To make the monster mud I used a mixture of half a gallon of black latex paint with 5 gallons of drywall mud. I ended up using ¾ of the mixture for this prop. Use a drywall mixing drill bit to mix in the paint. You will thank yourself for spending the 5 bucks to get this tool if you don’t have one already. Cut you burlap and test fit them on your prop so you can make sure everything will cover correctly. Next I took a blade and tattered up all the edges of the fabric to try to give it a worn look. 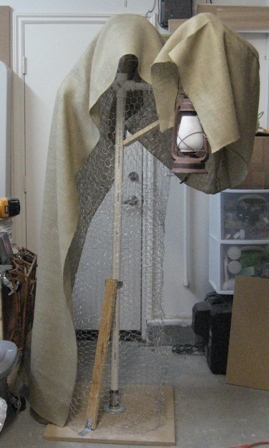 Once you got all your pieces on play around with them until you like the overall flow of the fabric on your prop. You can also slap on some mud and work it onto the fabric if you missed some spots. Let your prop dry for a couple days and it will become significantly lighter when all the water dries out of the mixture. Spray the inside of prop where you can see the chicken wire with black flat spray paint. I sprayed inside the hood and under the arm. Makes it looks really creepy at night when it’s just a super dark nothingness inside his cowl. Now we want to water proof our prop so it doesn’t turn to mush when its outside in the weather. I used a can of Drylock which is a masonry sealer. It has a grainy texture to it which actually gives it a stone like appearance. Optional : I bought a can of Rust-o-Leum stone spray paint and sprayed my whole prop to give it and even more stone look. The next painting step I applied a dark grey wash. Mix some black paint from the same can you used for you monster mud with water. Dilute it with water so you can let it run down your prop. I used some foam brushes to soak up the water then blotted them on and let the wash run down. Finishing touches: I am going to have my reaper holding a lantern to give it some nice somber lighting. Also I am going to affix some Spanish moss to make it looks like it been sitting in my graveyard for many years. Hope this helps everyone out who wants to try out the prop. It was a lot of fun and you can really go nuts making all sorts of things. If you have any questions don't hesitate to send me a message and I'll do my best to help you out. Don't forget to post pix your creations! Very nice. The pics make it seem like a good beginner project. Great project tutorial...lots of detailed pictures. thanks so much for the long-waited tutorial... This is still the best looking reaper I have ever seen. Why rule the living when you can control the dead. That thinlooks great. Me and the wife was wondering exactly how this was done. That was a great explnation with great pics. Thanks. That is a GREAT looking Reaper! How much does he weigh now that you added the monster mud? It weighed a ton when the monster mud was wet but after it drys all the water in the mud evaporates and it becomes a lot lighter. I would say the whole thing weighs maybe 20 lbs. It's very manageable and easy to move around with a hand truck. thank you for doing a step by step guide, I am seriousely concidering doing this now, I didn t really wanna have anything to do with M.M. before. Do you only have to do one coat of the monster mud? and it it stiff stiff stiff? and do you think you'll do more of these? Excellent! Thanks for sharing your how to. Your grim reaper looks great. And there is still time to make a matching one. Today the Pond. Tomorrow The World! I. need. to. have. this. in. my. graveyard! Great tutorial. I can use the basics for many things.